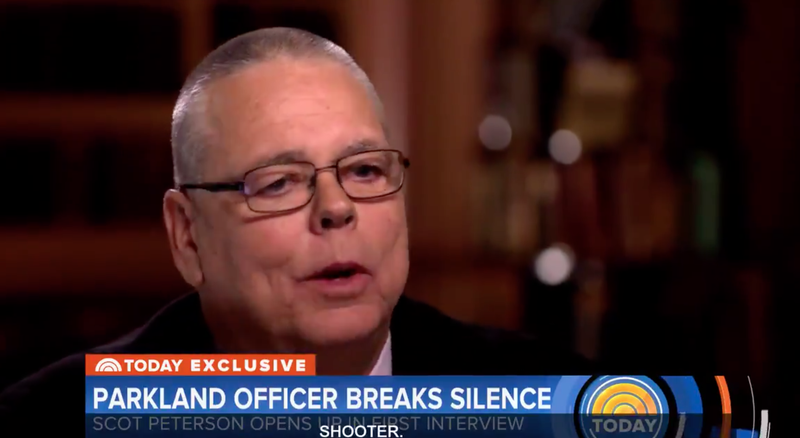 Scot Peterson, the Broward County, Fla., sheriff’s deputy who was forced to resign after footage showed him failing to enter Marjory Stoneman Douglas High School in Parkland, Fla., as a gunman shot 17 people inside. In his first interview since the February shooting, Peterson told the Today show’s Savannah Guthrie that he lives with his failure to act. A short clip was shared on the show’s Twitter account Monday morning. “Would you acknowledge now that in this really important moment, you missed it?” Guthrie asked, referring to his decision not to enter the building. “I live with that; how could I not?” said Peterson. The Broward County sheriff’s officer was forced to resign after security footage from a school camera showed him waiting for four crucial minutes while a gunman, later identified by authorities as Nikolas Cruz, shot up Stoneman Douglas High School. The shooting spree lasted approximately seven minutes. “In a perfect world, I would have said, ‘Oh, there’s a shooter in there; let me go to the third floor, find this person,’” Peterson said. It’s unclear from the short clip what exactly Peterson feels he needed to have known before entering the building. Many, including President Donald Trump, called Peterson’s actions—or lack thereof—cowardly (the Boston Globe went so far as to refer to Peterson as “the Broward Coward” in its coverage). And when Florida lawmakers proposed arming select school faculty and administrators to prevent future shootings, some pointed to Peterson’s case as an example of the limits of arming school authorities, particularly educators with limited weapons training. The full interview with Peterson will air Tuesday morning on Today. California High School Teacher Fires Gun in Classroom During Safety Lesson, Injures 3 Students and ... Must I Really Go On?